Comic Book Culture: Fanboys and True Believers, Matthew Pustz, University Press of Mississippi, 1999, ISBN 9781578062010, 244pp. I’m using this book in my college writing course (“text+vision”) this semester, and it is exactly what I wanted from a cultural overview of comic book fandom. Pustz does a great job of explaining how fandom came about, how it compares to other cultures (with a consistent reference to baseball fans, for example), and some of its peculiarities. In particular, he is able to partly explain the incestual nature of consumer and producers in comics, where each is a responsible party to the worst excesses of the medium, yet Pustz is careful to not make a judgment statement about this (unlike me). This book is not a history of comics, of who published what first and which creator sued which publisher. For that, you should check out Bradford Wright’s Comic Book Nation. It’s not even a history of comics fandom, although it does gather quite a bit of that together in its pages (Bill Schelly covers the history of fandom in more detail). What Pustz tries to cover is the area inbetween–where fans and publishers met. This is the culture of comic books, the place where the two groups make something together, and at first it may seem strange to think of consumers as producers, or producers as consumers. But, through his analysis of comics letters pages and fanzines, Pustz shows how the two groups affected each other. 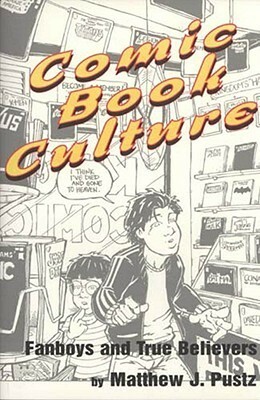 Comic Book Culture is copyright 1999, but feels like it was written in 1996 or 1997, mainly for the lack of focus on the incredible growth of manga in America and how Pokemon, DragonBall Z, and Sailor Moon are revitalizing comic book culture by bringing children back to comics. The last three years have also increased the importance of the Internet on the culture, which Pustz talks about briefly in the chapter 5. Finally, he really doesn’t get much chance to focus on the rise of the graphic novel as an option for reading the medium compared to the ephemeral magazine. As a textbook in a cultural study hybrid course, this book is perfect. For the average comic reader, it might be interesting to discover aspects of the hobby that you didn’t know about. And it might just be the thing to share with parents or friends who don’t understand why you keep reading Spider-Man, even though you’re over 30.